With all our amenities and our premier location, it's no wonder why MacDonald Highlands is the best of Las Vegas high-end real estate. Last week, we touched on the definition of luxury real estate. In essence, for a property to be considered high-end real estate, a seasoned appraiser must inspect it. MacDonald Highlands has had plenty of professionals to appraise our land, which inflated our value in Las Vegas luxury real estate accordingly. But what were the amenities the appraiser justified in making MacDonald Highlands the exemplary of high end real estate? Below are the reasons why MacDonald Highlands is the supreme in Las Vegas luxury real estate. MacDonald Highlands is located in Henderson, Nevada, which is ranked as one of the “Safest Cities in the United States” by the FBI Uniform Crime Report. Additionally, MacDonald Highlands sits along the edges of the McCullough Mountains and overlooks the Greater Las Vegas, including the Las Vegas Strip. These views and rankings provide a unique and value edge to the community; thus, raising its value. MacDonald Highlands was also planned to be the lowest density luxury community in Southern Nevada. This means that our residents have plenty of space to enjoy their high-end real estate without bumping into too many of their neighbors’ yards. 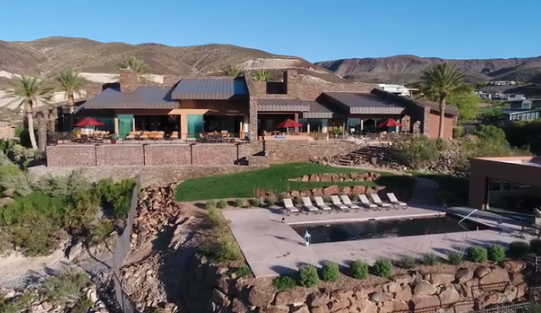 MacDonald Highlands is a 1,200-acre community squared off on the Las Vegas outskirts. The exclusivity of the community along with the location of the McCullough Mountains prevents expansive amounts of urban sprawl. Meanwhile, our high-end real estate lot sizes range from 4,500 to 7,000 in square footage. They are all custom built and are pinnacles of contemporary designs and architecture. The size of the community, the typical square footage and each home’s curb appeal inflate MacDonald Highlands’ value. But what else does one expect when you have the crème de la crème of Las Vegas luxury real estate lots? MacDonald Highlands is a gated community. Train guards secure all the entrances and exits of the neighborhood. This means extra security for you and your family. Additionally, residents of MacDonald Highlands have access to the DragonRidge Country Club, Golf Course and Tennis and Athletic Center. Instead driving all around Vegas for these three separate entities, MacDonald Highlands provides them for your general enjoyment and a healthy lifestyle. Hop in the car with your loved one for a night of luxury at the country club: ballroom dancing and cocktails, the works! Or you can take a partner out to see if you can go below par at the award winning golf course. Bring the kids to the private golfing school if they want to ramp up their game. Or if you prefer to practice your backswing or take your first class of Pilates, the Tennis and Athletic Center is there to help you with any active lifestyle choice. MacDonald Highlands is the community for you if you love to shop. Its location is in close proximity to both the District at Green Valley Ranch and the Galleria at Sunset. Not only are these the hubs of casual shopping in Henderson, they are the Meccas of restaurants, schools and banks. Never again will you have to drive far from your home. MacDonald Highlands is also far enough to enjoy the sight of the Strip without any of the traffic or noise. When you feel so inclined to venture to the Strip, it’s just a short trip on the conveniently-located freeway just a few miles from the property. Close enough that it’s actually quicker to take surface streets, but not too close that you hear noise pollution. This short list barely scratches the surface of the amenities we provide at MacDonald Highlands. Regardless, you can see why we are the premier in high-end real estate. No matter what tastes you have, MacDonald Highlands is the place for you. Amazing views, homes, amenities— we have it all. Act now before all the luxury real estate lots are snatched up. Contact our office today to meet with one of our professional realtors and start living the dream.